This is a milestone week for Melissa, she is preparing to leave her family home of 27 years to pursue independent living for the first time. “I’ve been packed and ready to go for a while!” Melissa jokes. 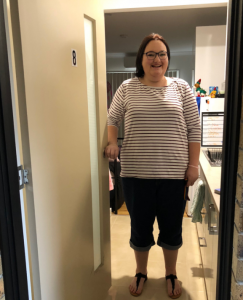 Moving out of home is an exciting time for any young person, but for Melissa who has an intellectual disability, independent living has been her number one goal for years. When the time came for her NDIS planning meeting with Brotherhood LAC Felicity Bennett, Melissa and her mother Christine were thrilled that progress was finally being made. On waiting on the outcome of her planning meeting, Melissa admits to feeling a little nervous. Melissa’s NDIS plan was approved and included support for supported independent living. Since learning the outcomes of her planning meeting, Melissa hasn’t stopped smiling. “It’s all happened so quickly, I couldn’t be more excited” she says. Prior to the NDIS, Melissa’s mother Christine had been her primary carer for 27 years, receiving little to no support for Melissa’s every day needs. Now thanks to the NDIS Melissa receives daily one on one support, which will continue when she moves into her new home in mid-July. On the progress her daughter has made in such a short period of time, Christine couldn’t be more proud. The outcomes of the NDIS have also been life changing for Christine, who can feel rest assured that her daughter is now supported to confidently pursue her goals. The support of the Brotherhood has allowed Melissa to at last put her goals into practice, she now has the capacity to independently access her community and pursue goals that once seemed unattainable whilst living at home and relying on family for support. “Our experience with Local Area Coordination was wonderful, the personalised approach from Felicity made our outcomes that much more special” Christine says. Will she miss having her daughter at home? Yes, but Christine won’t be too far away. “I’ll definitely miss her, but I already have plans to sleep over the night she moves into her new place!” she laughs. Mother and daughter couldn’t be happier with the planning experience, the outcomes allowing Melissa the freedom to pursue an independent life. Of upcoming milestones Melissa’s focus will next be on getting her driver’s license and finding employment. With a love of animals, a job working alongside them would be ideal. It’s been a big year so far for Melissa, and this is sure to be just the beginning.